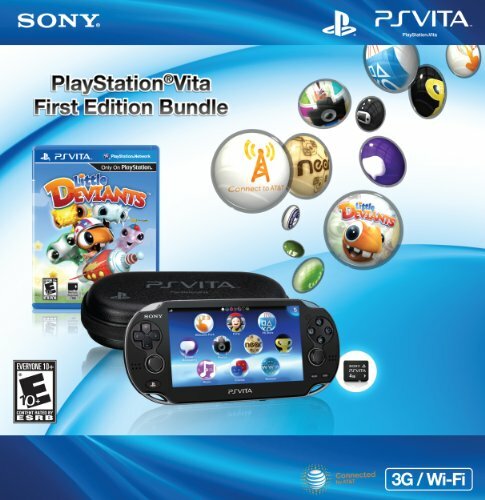 Claim your PS Vita week before the official release date with the PlayStation Vita First Edition Bundle. Become one of the first to discover the new ways to play the biggest and best games. For a limited time, get the PS Vita 3G/Wi-Fi system plus a 4GB memory card, a limited edition case, Little Deviants, and pick up your system one week early. •	Claim your PS Vita 3G/Wi-Fi system one week before the official release date. •	Blur the lines between entertainment and reality with breakthrough controls, including back and front multi-touch screens and dual analog sticks. *Mobile Broadband access requires DataConnect Pass plan for other specified devices. Time begins expiring immediately upon purchase/activation, whether you are using the service or not. Once your time expires or the allotted data is used, whichever comes first, your data access will cease. 30 day domestic plans automatically renew, unless you cancel auto-renewal. Fees are non-refundable. For full terms see Data Connect Pass Wireless Data Services Agreement on www.att.com/wirelesslegal. Mobile broadband coverage not available in all areas.